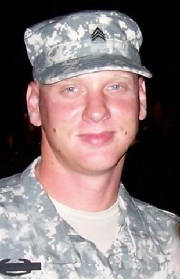 PFC Cummings was killed in action on Feb 14, 2007. "I was born in Florida in Jan. 1987. I love cars and motorcycles. I drove my first car at the age of 12. I have a dog named Dylon that I've raised since he was 8 weeks old. 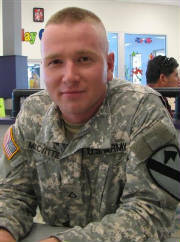 After I'm out of the army I plan on joining the SWAT team and starting a family." 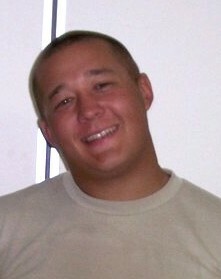 Branden was 20 years old. He was a bradley operator. See more photos of Branden HERE. 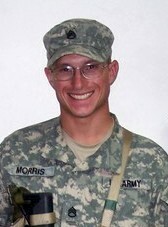 SSGT Morris was killed in action on Nov. 25, 2006. 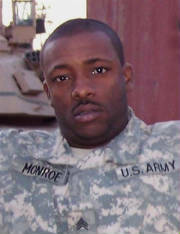 SSGT Morris will always be one of "Our Guys"
Most of the guys are a year older than listed on this page. They've been over there THAT long! A few have been updated. Ranks were updated on Oct. 2, 2007 so are hopefully accurate. If your photo is on this page, but you prefer it not to be, please let us know and it will be removed. LZ is one of the new guys. Read story HERE. See LZ's personal page and photos of his newborn son HERE. "I'm from Ohio. This is my second tour to this replica of hell. I'm married w/3 kids; 2 girls and 1 boy. I'm 28 years old and getting older by the second. 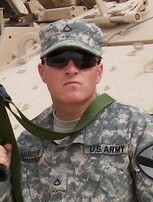 I joined the army in 03 and have been going strong ever since. Thanks for the support." See more photos of Nick HERE. R&R photos are HERE. "My gratitude first and foremost to all of you who are supporting the true fighters of this war, the men of the Infantry. I have the honor of doing my second tour with a bunch of chest pounding, Iron fisted, Steely eyed grunts. Never good for the bad guys. I'm 31 years old, married to my wife Marie, and my son Logan who is the blood that flows through my veins. 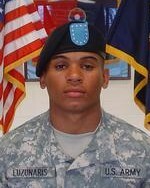 I am a professional soldier, 11Bravo, a grunt and proud of it. Thank you again for your support. Without it would be a time of sorrow." 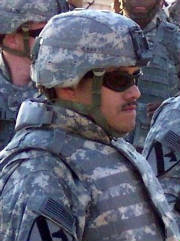 I was born and raised in Washington State were I lived until I joined the Army in 2003. I was first stationed in Hawaii, where I met my wife Noelani. We were married on the beach Christmas Eve, 2003. 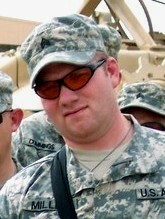 I served a year deployment in Afghanistan in 2004 and this is my second deployment.I love music and I'm a blues enthusiast. I have an extensive guitar collection in which I am still adding to. I am looking forward to returning home, starting a family, and rebuilding a 1971 Cudda. See more photos of David HERE. “I was born in Bonham Texas and raised in Florida. I have a beautiful daughter named Makayla and a lovely wife named Tamika. 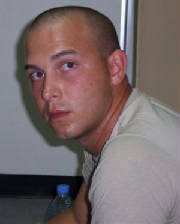 I have served one year in Iraq before and am serving my second year here now. During my free time I go to the gym and work out. I am a team leader and a gunner in the M2A3 BFV. 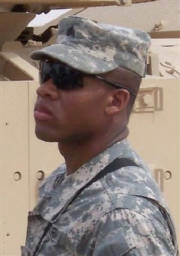 (bradley fighting vehicle)” See more photos of SGT G. HERE. 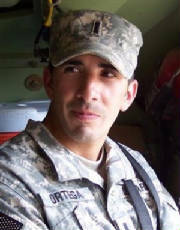 Lt Ortega is from Utah. He is married to Heather and they have three daughters aged 11, 5, and 1. 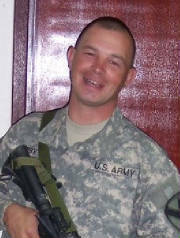 He joined the army in 1996 as a 19-Delta Cavalry Scout. 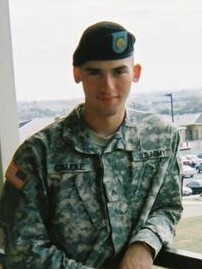 He has served at Ft. Knox, Camp Casey, and South Korea. Brian and his wife, Mary, were married in March, 2007. He is a prior service Marine. He is from Maine. But not pictured here yet. “I was born in the Caribbean and moved to New York when I was about 13 years old. I’m married with three kids. 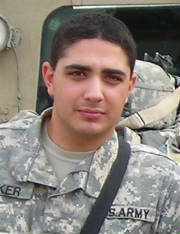 T his is my second time around in Iraq. 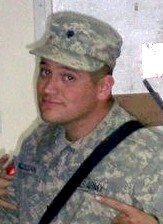 I enlisted in the army five years ago and plan on staying four more. 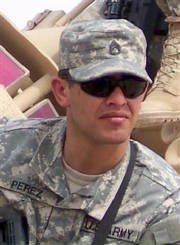 I want to thank you all for your support and I also want to thank you for your own service. 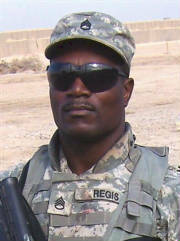 Infantry leads the way!” See more photos of SSG Regis HERE. See HEROES. Brad was raised in California. "I was born in Reno Nevada and raised in northern California. This is my first deployment. I have two years left in the army and if I don't re-enlist I plan on moving back to CA and going to college to get my masters in business administration. 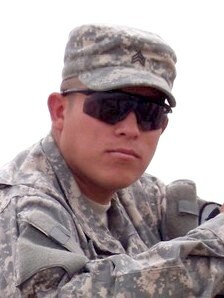 I appreciate all your support.."
“I came from southern California to join the army for three years and serve my country. 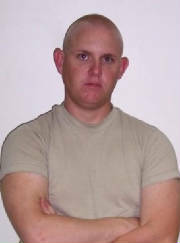 I love to do Brazilian Jiu-Jitsu but in the army it’s called combatives. It’s one of the best decisions I ever made.. Thanks for all your support and God bless.” You can see more photos of Jeff HERE. “I was born in Indiana. 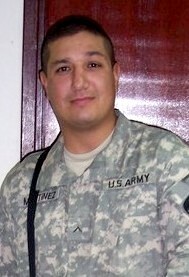 I joined the Army late; I'm 33 yrs old. They call me an old man but that’s okay because I do my job well which is killing terrorists. 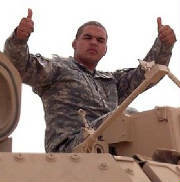 I'm a bradley fighting vehicle gunner and proud of it. When I get out of the Army, I'm going to Chicago to be a Chicago cop and arrest drug dealers. God has blessed my life.” See more photos of Roy HERE. “I've been in the army for 7 years now and I'm planning on making it a career. I have a fiancée, Hillary, and two beautiful step-children-to-be, Ian and Kiernan. I'm planning on long range surveillance detachment or special forces or going swat after I retire. See more photos of Jason HERE. R&R photos are HERE. “I was born and raised in Southern California. I'm married and love my wife very much. We have a kid on the way, due march 3rd. I love dirt bikes and lowered trucks. I love my job but I can't wait to get home.” See more photos of Nick HERE. Nick was reassigned to another unit. 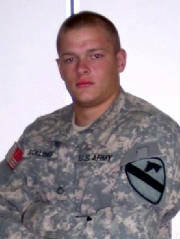 Jason was born in Emporia, Kansas. 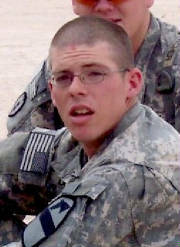 He completed his basic training at Ft. Benning, GA. See more pictures of Jason HERE. Destry is one of the new guys. 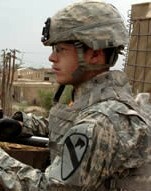 He graduated from basic training in January and was deployed in March. Read his story HERE. "I’m married and have two kids, a boy and a girl. 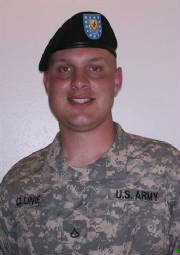 I’m waiting to get out of the army and move back home to Minnesota to work in the taconite mines. I like music and classic movies." See HEROES. "I'm from Lousiana. I've been in the army for four years and plan on staying another four. I'm not sure what I'm going to do after that. I am married to my wife, Cara. We have twin baby girls, Mia and Chloe." See more photos of Brian HERE. R&R photos are HERE. Patrick is a professional MMA Fighter. When he gets out of the Army he plans to keep up his fight career. Patrick is from Kansas. “I’m getting ready to fight in the UFC (ultimate fighting championship) when I get home. I’ve been to Iraq once before. I like grappling, mixed martial arts, and I love punk music.” See more photos of Patrick HERE R&R photos are HERE. “I’m from Oregon. I used to drive box trucks and work in warehouses. 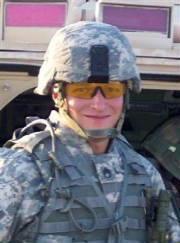 I enjoy 4-wheelin’ and off road racing.” See more photos of Eric HERE. Nathan comes from Missouri. 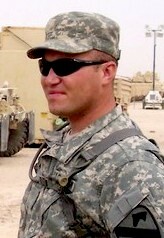 He joined the Army in April, 2005. 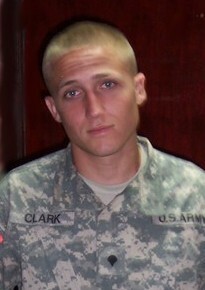 After graduating from Basic Training and AIT at Ft. Benning, he was assigned to 1st Cavalary Division at Ft. Hood Texas. He left Ft. 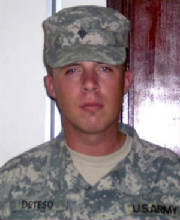 Hood for Kuwait on Sept 2, 2006 as part of the advance team. He helped unload the vehicles from the ship and relocate them to the camp. Nathan is interested in carpentry, playing the guitar, writing songs, and drawing. See more photos of Nathan HERE. R&R pics are HERE. Nathan is currently back at Ft. Hood for medical reasons.